West Papua Freedom Flotilla spokesperson Izzy Brown has confirmed that the Freedom Flotilla will set sail from Darwin this year to undertake their latest direct action on the high seas to highlight damage caused by multinational corporations and colonial governments on the land and people of West Papua, specifically targeting major shareholder Rio Tinto and the Freeport Grasberg mine in Timika. ”We’re targeting Rio Tinto and the Freeport Grasberg mine because the genocide they are committing on the West Papuan people is disgusting. Not only are they funding the Indonesian military to kill indigenous West Papuans, they are also poisoning the land and water beyond repair and disregarding global environmental standards,” Ms Brown said. 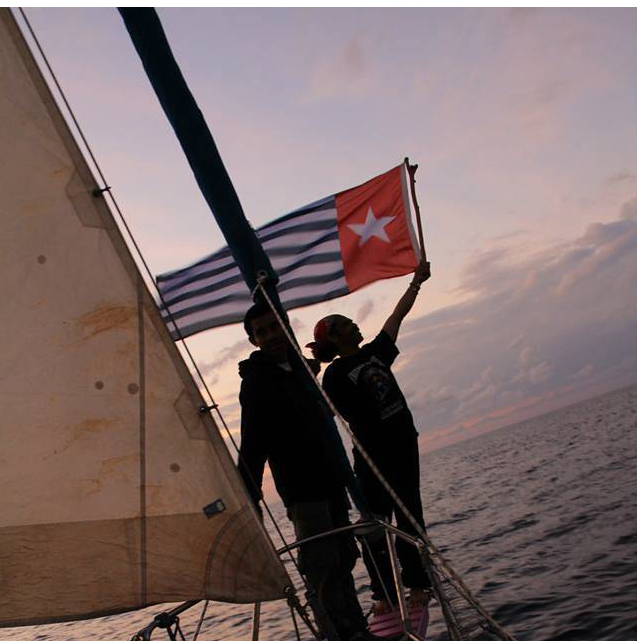 The Freedom Flotilla to West Papua successfully defied the Indonesian Navy and Australian authorities in 2013 when they completed their mission to reconnect West Papuan and Aboriginal Peoples. After a 5000 kilometre journey from Lake Eyre in South Australia all the way to the so-called Indonesian border north off the Torres Strait Arabunna Elder, Uncle Kevin Buzzacott, delivered sacred water from his own country and ashes from Aboriginal tent embassies around Australia directly to West Papuan leaders. The secret ceremony took place between two small boats off the south coast of Papua, avoided interception by authorities and gained global media attention putting West Papuan issues in the spotlight. Freedom Flotilla – Taking direct action on the high seas against human rights abuses dispossession and poisoning of indigenous land and water in West Papua. A river of poison flows from the last tropical glassier in the world. It is a sacred place for the Amungme People.The glassier is called Nemangkawi ‘’the white arrow’’. Many people have died by the hands of the Indonesian military who control the area since the mines inception.The Indonesian military are payed over 3 million dollars a year in “protection money” by Freeport McMoran which operates the nearby Grasberg goldmine. ‘’The republic of Indonesia kills people like me, Amungme people, the land the military own in Timika was not bought, it was taken at gunpoint. The Indonesian military is used as a tool by Freeport mine to kill us.’’ Mama Yosepha Alomang. In 2013 the freedom flotilla reconnected the lands and the struggles of Papuan and Australia indigenous people with a sacred ceremony conducted in the water off the coast of Papua. Indigenous elder Uncle Kevin Buzzacott of Arabuna country in South Australia delivered the sacred water from the mound spring in his country and ashes from the Aboriginal tent embassy’s around Australia to West Papuan Elders leaders and Activist to reconnect the land and people that were once joined. 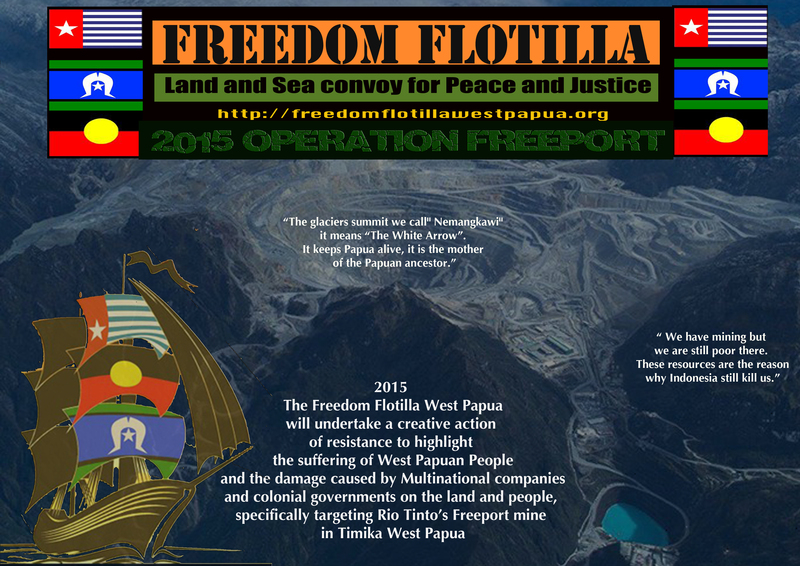 This year the Freedom Flotilla wants to follow up that reconnection with an action to highlight the suffering of West Papuan People and the damage caused by Multinational companies and colonial governments on the land and people, specifically targeting Rio Tinto’s Freeport mine in Tamika West Papua. Grasberg Freeport McMoran mine In partnership with Rio Tinto the mine accumulates some 700,000 tonnes of toxic mine waste tailings per day ’(that’s nearly 26 billion tonnes a year) discharged out over the mountain polluting the head waters of the life line of the Amungme people. West Papua is the scene of the most brutal colonial genocide in the region since Britain’s invasion of Australia. The ‘state torture and terrorism’ inflicted on West Papuans is the saddest and most horrific situation a human being can endure. This World Environment Day, June the 5th 2014 an Earth Embassy will be established at the Victorian Parliament House precinct. The Embassy is a reclamation of the sovereign indigenous land and will represent a united front of world indigenous movements against the destruction of the earth and its peoples. The autonomous space will be a hub for all earth defenders to establish a presence on Aboriginal land and bring their issues to the city streets. The protest features the First-nations Liberation Movement (FnL). They will bring Black issues to the conversation on World Environment Day, creating a space for indigenous people to join forces in solidarity with others responding to the ecological emergency facing our planet. West Papuan indigenous activists will construct a traditional hut to bring their demands for environmental justice and human rights in their homeland to Melbourne. SBS: Was it legal to deport West Papuans to PNG? Questions are being raised over whether Australia acted lawfully when it sent seven West Papuan asylum seekers to Papua New Guinea after they were apprehended in the Torres Strait. Greg Dyett and Stefan Armbruster reports. People in fear for their lives or political activists intent on grandstanding? Prime Minister Tony Abbott says the seven are in the latter category and it was appropriate for them to be transported to Port Moresby under a 2003 Memorandum of Understanding with Papua New Guinea. The seven from the Indonesian province of West Papua, including a 10-year-old child, took part in a ceremony involving the handover of sacred water and ashes from Australian Indigenous elders. Tony Abbott has repeatedly refused to say if his signature policy of turning asylum seeker boats back to Indonesia will ever be put into practice. Asked in Jakarta on Tuesday if his Operation Sovereign Borders would push back any boats he said that, based on his conversations with the Indonesian government, including Susilo Bambang Yudhoyono, “we are confident that this problem will be dealt with”. Indonesia has opposed the turn-back policy since March, 2010, when Mr Abbott first announced it. The Prime Minister’s comments seem to concede that he may abandon it as part of a willingness to negotiate a bilateral approach to the issue in meetings on the subject due to convene in coming weeks. He also appeared to waver on other parts of his contentious policy, saying that village spies and buy-backs of fishing boats were nothing more than a pot of money available to local Indonesian officials “working cooperatively with their Australian counterparts to ensure as far as we can we’ve got people working with us rather than against us”. He was not asked to comment on the policy of establishing transit ports on Indonesian soil for Australia’s use in moving asylum seekers to Nauru and Manus Island. Mr Abbott’s apparent concessions to Indonesian sensitivities comes after Dr Yudhoyono conceded on Monday that Indonesia must negotiate directly with Australia on the boats issue, not just through the forum of the Bali Process. An Australian activist group says the Australian government is doing its best to wash their hands of the plight of a group of West Papuan asylum seekers, which have been transferred from the Torres Strait to Papua New Guinea for processing. A spokesman for Freedom Flotilla, Ruben Blake says the asylum seekers took part in a welcoming ceremony involving the handover of sacred water and ashes from Australian Aboriginal elders in the Indonesian province of West Papua. Reposting from Rize Forum: Flyers have been distributed calling for peaceful actions and prayer to welcome the flotilla on the 27th and 28th August.